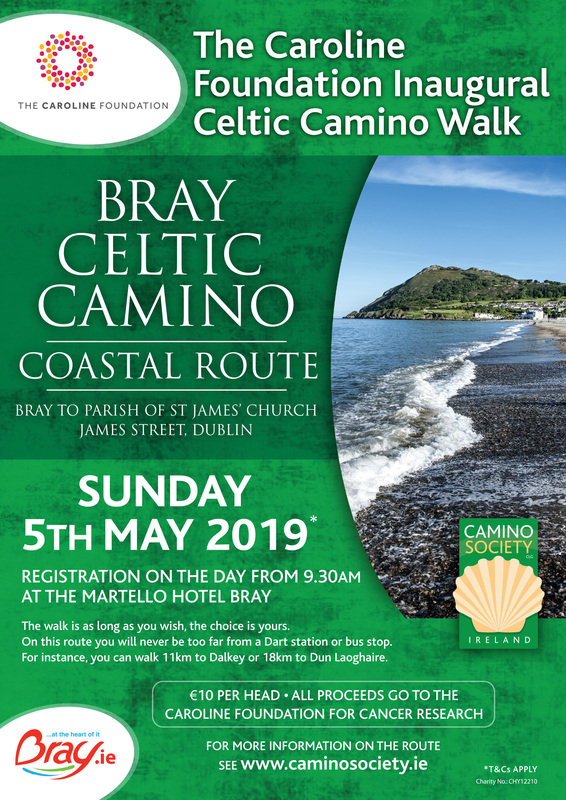 The Bray Coastal Celtic Camino route to St James’s Church in Dublin takes place on Sunday May 5th at 9:30am. The walk is organised by Kieran Leonard and his team in aid of the Caroline Foundation for Cancer Research. Camino Society Ireland are delighted to note that the walk is on a Celtic Camino Route. Registration for the walk opens at 9.00am in the Martello Hotel on Bray Seafront. Fee €10, paid at registration. The walk is as long as you wish, the choice is yours. On this route you will never be too far from a Dart station or bus stop. For instance, you can walk 11km to Dalkey or 18km to Dun Laoghaire. You can walk all the way to St James’s Church, Dublin collecting stamps in your Pilgrim passport and receive a Celtic Camino Compostela (Certificate). Official Camino de Santiago Pilgrim passports will be available on the day for a small donation.